The author’s grandmothers, circa 1940. Left, Angelina Ferrara Palleschi (maternal grandmother), and Teresa Munafo Salamone (paternal grandmother). Photo courtesy of Kathleen Garrett. The winter rains had subsided for the moment, but the coastal night air remained chilly and damp. My rent-controlled apartment, with its lack of insulation, mirrored the outside evening temperature, as I sat at my desk struggling to meet a self-imposed deadline. Shoes aren’t allowed in my home, not even for me, and with porous window seals in this old building and its wooden floors, my cold feet needed something warm to cover them. I’d been away from Santa Monica for quite some time and had yet to fully unpack and organize my apartment. The floor of my closet was a wreck. Piles of miscellaneous footwear and chaos lay everywhere as I dug through debris in the hope of finding a matching pair of slippers. There, stuck in the corner under the shoe rack and covered in dust, lay a forgotten pair of brightly colored, orange, woolen slipper-socks my Sicilian grandmother, Teresa, knitted well over a quarter-century ago. I salvaged the little booties, quickly put them on, and was struck by the gems on my feet. The knitting was close to perfect, the craftsmanship remarkable, and the bold orange and light-green yarn woven throughout showed such a playful humor that it made me smile. Everyone in the family—her children, grandchildren and great-grandchildren—was given my grandmother Teresa’s crocheted wares. Sometimes they were given as birthday or Christmas gifts, but most of the time when she finished a project she would offer the crafted article to whomever wanted it. In my youth, I considered her creations passé and unfashionable. But as the booties instantly warmed my feet, I examined these meticulously made items more closely, marveling at their workmanship and my grandmother’s gumption. 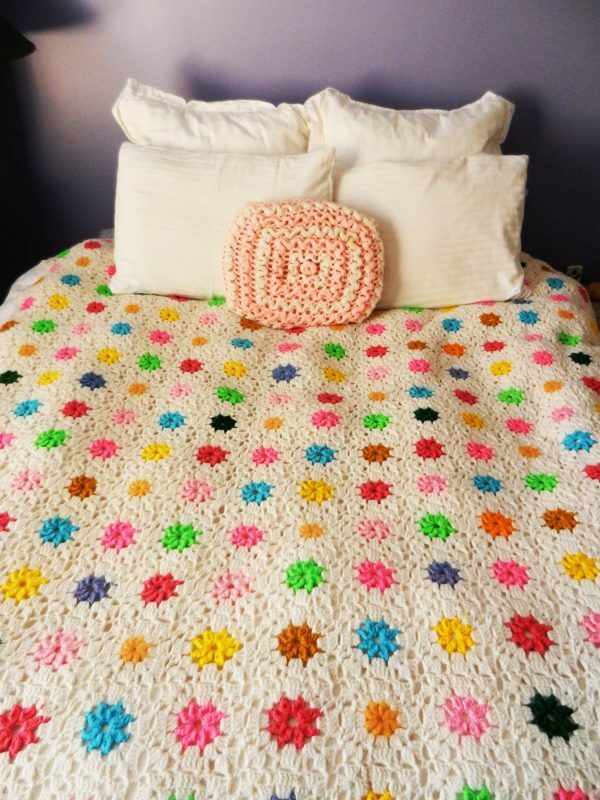 Bedspread afghan, made by the author’s grandmother. Photo courtesy of Kathleen Garrett. My eye caught another woolen object sticking out from the mound of wreckage at the bottom of the closet. Shoving shoes, boots, and whatever else in that pile aside, I pulled out a knitted wire hanger. Years before the velvet, non-slip hangers became popular, my resourceful grandma took metal hangers and crocheted over them. This woolen covering not only prevents clothes from falling off, but also makes the unsightly wire attractive with bright, multi-colored yarn intricately stitched around it. Making the best out of unlovely things was a particular skill of Teresa Munafo, born in the small town of Fondachelli-Fantina, Sicily, in 1901. Her father bought cheese from local farmers, picked filbert nuts and sold them in the coastal city of Messina, some 80 miles away, while her mother raised their four small children. In 1908, the massive Messina earthquake struck southern Italy, killing her father and leaving the family destitute. Teresa’s education never went beyond the third grade, as she and her siblings had to quit school and work picking crops for pennies. At night and whenever there was free time, she and her sister would weave and crochet garments and coverlets for the family. Teresa’s older brother, at 14, left to find work in America and sent what little money he earned back to the family. Her sister married at 14 or 15 (the exact age is unclear), had two children, then died of a heart attack at 19. Teresa found herself pregnant out of wedlock by her first cousin, Carmelo Salamone, when she was 19; a scandal in her strict Roman Catholic family and community. But Carmelo was unaware he was to become a father, and shipped off with his brothers and male cousins in 1920 for America. Learning of Teresa’s condition, he was forced to return to Italy to marry her. Her older brother scornfully asked before her wedding, “Aren’t you ashamed to wear a veil?” referring to its symbolism of purity, which he felt she no longer deserved. Carmelo then went back to America, and two years later sent for Teresa and their new son to join him. They settled in a large Italian community in Schenectady, New York, which is where Teresa further honed her skills with knitting needles, learned English, and became a businesswoman. 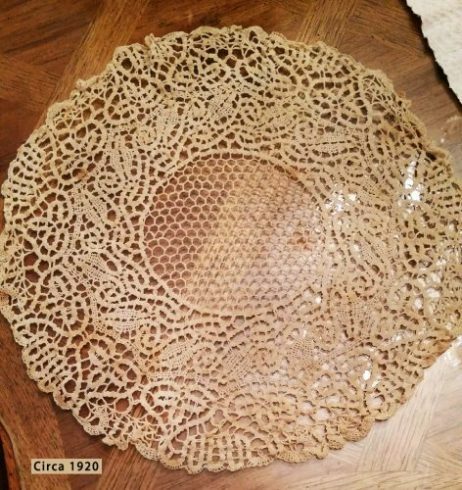 Doily, circa 1920, made by the author’s grandmother. Photo courtesy of Kathleen Garrett. Hanging in the back of my closet was a deep burgundy, button down, knitted sweater my grandmother made when I was a teenager—not much younger than she’d been when she became pregnant with her first child. At that age, I didn’t think this handcrafted garment was trendy enough to wear, though I couldn’t part with it either. In examining the cardigan more closely on that damp night, I realized its three-quarter sleeves and scoop neck were not out of date at all, but rather fashionable, so I put it on. The softness and warmth of the wool caressed me as though it were the loving embrace of my long-departed grandmother. Although Teresa had only minimal education, she possessed the work ethic and ingenuity of an executive. When the Great Depression rocked the world, the migrant community of Mont Pleasant, a sub-section of Schenectady, was hard hit. Basic household items, such as blankets and curtains, could not be purchased in stores, so the women of the neighborhood sewed, knitted, and crocheted in groups, making these necessities for one another. A loom was set up in Teresa and Carmelo’s driveway and the women worked together to create comforters and window dressings. A horse and wagon came around, selling thread, yarn, and other needed materials for their projects. This gave Teresa the idea to purchase the materials from wholesalers in New York City, and sell them for a small profit to the neighborhood paisans. As the demand for material grew, so did my grandmother’s need for a supply room. She took over one of her sons’ bedrooms, moving him into his two brothers’ tight sleeping quarters, and filled the new storage space with shelves of material from floor to ceiling. Business went so well that she and her husband decided to buy the apartment building across the street, and convert it into a department store, and thus the family business was born. The beautiful afghan stretching across my queen-size bed is her largest and one of my most treasured heirlooms. It is white with little granny squares of multi-colored flowers knitted throughout. This particular type of blanket was a special work. My uncle offered me his one day since he had so many other knitted throws and blankets she had made. I was thrilled to possess such an artistic treasure. Looking at the stitching more closely, my grandmother’s nimble fingers appear like a vision, rhythmically and supplely knitting in rapid precision. I recall her barely looking at her hands as her fingers swiftly moved the yarn in and around the needles, creating intricate patterns and designs. She never used a knitting outline or instructions of any kind. Nor did she ever count aloud or write down the stitch number. She just seemed to know how many knits and purls, traveling, twisted, and slip stitches she had done. She knitted blankets, sweaters, bedspreads, booties, baby caps, mittens. She crocheted tablecloths, bedlinens, doilies, and handkerchiefs. Even pocketbooks. There wasn’t anything my grandma’s knitting needles couldn’t create. 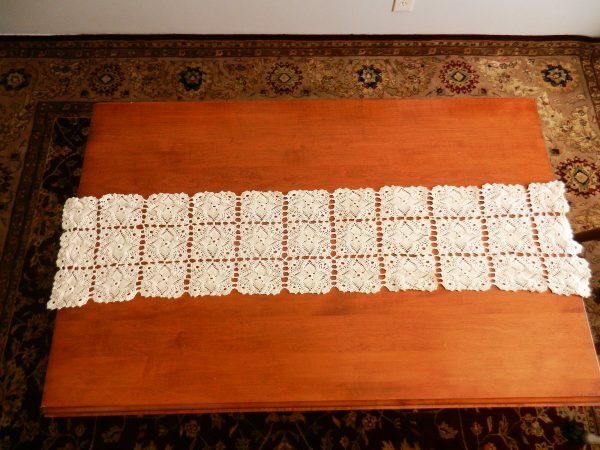 Table runner, made by the author’s grandmother. Photo courtesy of Kathleen Garrett. Being a disciplined and industrious woman, and believing idle hands are the devil’s workshop, Grandma Teresa attempted to instill her work ethic in her granddaughters, insisting we learn how to knit. But my adolescent temperament couldn’t appreciate the skillfulness and imagination of her work, nor how useful this craft could be. Years later, while performing in a one-woman show, I had to knit a sweater in a scene, and thought of all those times she tried in vain to teach me. Fortunately for me and the show, my character knitted badly. Another of her handmade, woolen blankets rests on the back of my sofa. It is a motif—loud, free, and fanciful, with wide lime green and hot pink stripes running throughout. In looking at these whimsical objects, I suddenly realized perhaps this was the only way my grandmother, a serious and formidable woman, could express the imaginative, childlike joviality that was kept bottled within her. Grandma Teresa was not always as warm as her creations. She did not spoil her grandchildren with outward affection, nor let the grandkids get away with behavior their parents would not allow. Perhaps she never knew what it was like to be a fancy-free child laughing and playing without a care in the world. Maybe the only way she knew to express her love to us kids was to insist on discipline, instill work habits, and give us the tools that brought her a successful life. Today, when I am wrapped in her afghans or my feet warmed by her knitted booties, I am reminded of my grandmother, Teresa Munafo Salamone—and inspired by her mettle to come to a new land taking on a different language, culture, and life, and having the courage to never stop creating. Kathleen Garrett is an actress, writer, and voice-over talent who works in Los Angeles and New York City. Her last article for Zócalo Public Square was the true story of how she and her sisters foiled a FBI bust on their father.